About a dozen attendees at the 2010 ALA Midwinter Meeting in Boston used a location based social network from foursquare (launched in March 2009). In some ways, it felt like the first time Twitter reached the ALA scene a couple of years ago. Pushing the boundaries and testing new technologies is one of the things I enjoy. More importantly, I enjoy discovering new ways to engage with my customers. Foursquare is a combination of Twitter, gaming, and Yelp (in fact, Yelp launched it’s own similar product while in Boston). Users “checkin” at venues using text messaging, web site, FoursquareX desktop application, iPhone, or Droid app. Other similar applications that I’ve been testing include Gowalla (fantastic UI), Brightkite (older service, but never took off), and the newly released Yelp (huge user base). When a user checkins to a location, options include pushing the checkin to Twitter, Facebook, or keeping it just for foursquare users. With the checkin you may leave a short comment. Using one the applications you can see other foursquare users who are in the same location or close vicinity so you could connect physically with the others if desired. There is some level of serendipity to using the application because you can meet new people or leave messages for others who checkin to the same location. For example, one morning I checked in to the convention center venue and one of my foursquare friends had left of message to join him in one particular program. All users who checked in that morning would see the same message. Networking with my friends using a combination of Twitter and Foursquare enhanced my experience at Midwinter and added a new level of fun to the experience. In addition to pushing to my Twitter or Facebook feeds, I can have friend checkins appear in Twitter as a direct message. This allows for even closer and immediate contact with friends. Part of the application feature on a mobile device is see the venue in Yelp and/or see all the Tweets posted in venue region. 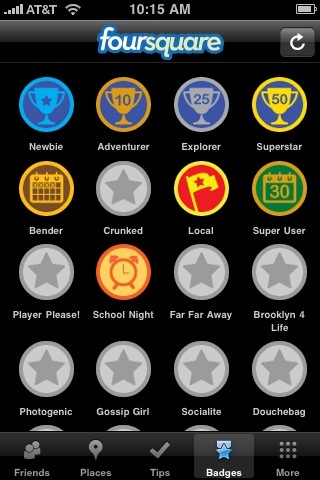 The game part of the foursquare allows users to collect “badges” for certain types of checkins. For example, I received the Overshare badge for checking in 10+ times in less than 12 hours. Users can also become the Mayor of a location by checking into the same location more than three times (until someone bumps you). You can still play the game without disclosing your location to the public by not pushing the checkin to your foursquare friends. When you do this, your checkin will appear as of the grid. A warning for new users: don’t push all your updates to your Twitter or Facebook stream. This can quickly become annoying to your Twitter friends. Choose selective posting to Twitter and always include additional comments so it is not just the location information. I also recommend turning off Twitter push for mayor and badge changes – you can still do this manually if you like. This coming semester I will attempt to engage my library users in this game. The idea right now is to generate a contest where students checkin to the library using foursquare and give prizes for Mayor and/or specific Badges. The prize could be a reserved seat in the library, priority reserve access, etc. The idea is still forming, but the possibilities are endless. What potential do you see for location based social networking? What do you think might work in your library? I'm planning to do some fun stuff with Foursquare at Annual. I already have a couple of ideas, but I'd love to hear suggestions from others, too. Thanks for this additional information on location based social networking Kenley – it is a good follow up to your impromtu tutorial at ALA. I love your analogy to Twitter a few years ago. I was thinking the same thing (and the people playing it were largely the ones on Twitter then). I also think your idea about reserved seats or other prizes for certain badges. What great fun! I'm waiting to see when we get more users in this area. I'm excited to know what you might plan for us at Annual. You might consider contacting Foursquare directly to get some custom badges made for the conference – maybe something like visiting a series of places (or vendors). My observation is that Gowalla is better designed for this but don't see why it wouldn't work with Foursquare too. Congratulations on signing up with Foursquare; I see you got the Newbie badge this morning. Excellent! Well, I had hoped to do something for the Networking Uncommons at Midwinter, so I tried to contact FourSquare to find out how to offer a badge, but they never got back to me. Hopefully the process (whatever it is) will get easier with more lead time. If nothing else (and there definitely is “else” I want to try), we want to offer a badge for checking in at the Membership Pavilion at Annual. If anyone has an “in” with Foursquare, please contact me! I was thinking that Foursquare would be a great assignment for LIS students: have them explore different libraries, check in, and have them complete to do lists at each location. Vielen Dank für diesen wunderbaren Beitrag. Bewundern Sie die Zeit und Mühe, die Sie in Ihrem Blog und detaillierte Informationen bieten.